Leading Manufacturer and Exporter from Delhi in India, our product range includes salwar suit for singpore such as Bollywood Wear Lehengas, Suit Salwar, Salwar Kameez, Indian Designer Salwar Suits, Salwar Suit and many more items. We are eminent manufacturers, suppliers, exporters and wholesalers of a wide gamut of Salwar Kameez. These suits are designed using optimum quality fabric which we procure from trusted vendors of the market. All the suits offered by us are immensely popular in between ladies for their high comfort level. Adding to this, our entire range is thoroughly scrutinized under the supervision of quality inspectors so that only high quality suits are delivered at clients' location within the scheduled time-frame. 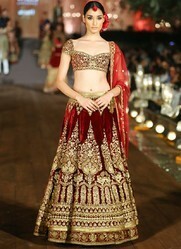 The anarkali suit is one of these styles which was recently brought back to the Indian fashion scene. The anarkali suit consists of a long, frock-style top which is known as the anarkali. The salwar, also known as the churidar, for an anarkali is usually slim, similar to that of leggings. Our eminent patrons can avail from us finest quality Salwar Kameez. The demand of offered suits are increasing among patrons as these are designed as per the latest trends of the industry. Apart from this, we manufacture these designer suits in accordance with the details given by patrons by making use of the latest designing techniques. Chicken Embrodiary Salwar Kameez is offered by us to clients in wide range. The offered Salwar Kameez is available in different colors and designs. We manufactured this Salwar Kameez as per the latest fashions and trends. We are the leading supplier of this Salwar Kameez. We also customized this Salwar Kameez for clients as per their requirements. Leveraging on our industrial expertise, we have been able to come up with astonishing Suit Salwar. Our provided designer suits are widely demanded as these are comfortable and free from defects. With an aim to ensure the presence of the above named attributes, we design these suits using quality approved fabric in compliance with industry laid norms and guidelines. Our eminent patrons can avail from us finest quality Indian Salwar Kameez. The demand of offered suits are increasing among patrons as these are designed as per the latest trends of the industry. Apart from this, we manufacture these designer suits in accordance with the details given by patrons by making use of the latest designing techniques. Suit Salwar is offered by us to clients in wide range. The offered Suit Salwar is available in different colors and designs. We manufactured this Suit Salwar as per the latest fashions and trends. We are the leading supplier of this Suit Salwar. We also customized this Suit Salwar for clients as per their requirements. Our eminent patrons can avail from us finest quality Salwar Suits. The demand of offered suits are increasing among patrons as these are designed as per the latest trends of the industry. 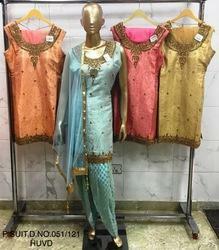 Apart from this, we manufacture these designer suits in accordance with the details given by patrons by making use of the latest designing techniques.